The Anemometer ML90s is a device for measuring wind speed between 0.4 and 35 m/s. The sensor is a propeller-type anemometer with the axis of rotation parallel to the direction of the wind. The number of revolutions is counted via a magnet and reed sensor and is converted to wind velocity. 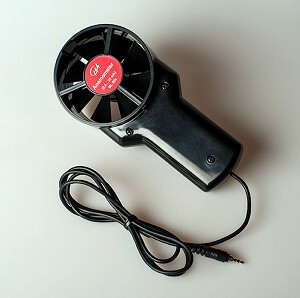 • Measure the wind speed of air generated by a variable speed fan. • Investigate why wind speed is slower over land than it is over the ocean. The Anemometer ML90s is a digital sensor (on-sensor digital conversion), which gives calibrated values of the measured quantity. This sensor can only be connected to the CMA MoLab interface and not to other CMA interface such as VinciLab, CoachLab II+ or EuroLab.